With the new market monitor charts up and running, it's a little easier to see how breadth was deteriorating over the past few months. While we're waiting for the markets to stabilize, now seemed like a good time to walk through the past six months. See charts here. Back on August 30th, the market was coming out of a multi-month correction with a bullish cross over on the primary indicators. Not withstanding a few minor corrections along the way, September through the end of December was an ideal trading period for swing and position traders. 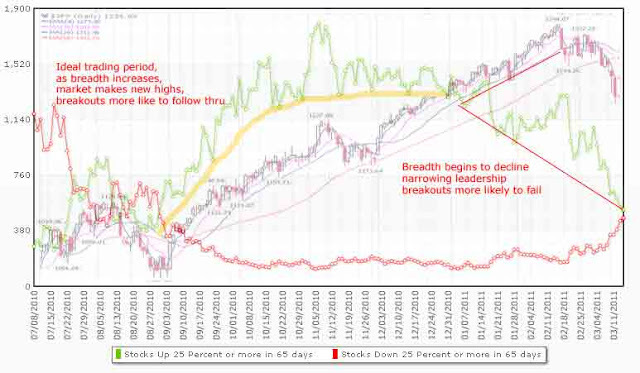 Breadth steadily increased and maintained its strength through December. Even when the SPX touched the 50 period ma in November, breadth remained strong and the market rallied higher from that point. In January, things began to take a different tone. As the market made new highs, breadth started making new lows. And as many people have told me there was still money to be made during that period. You can make money in any type of market, the difference is, leadership was narrowing and our trades have to be more specific to the sectors that were working. Otherwise, breakouts were more likely to fail. 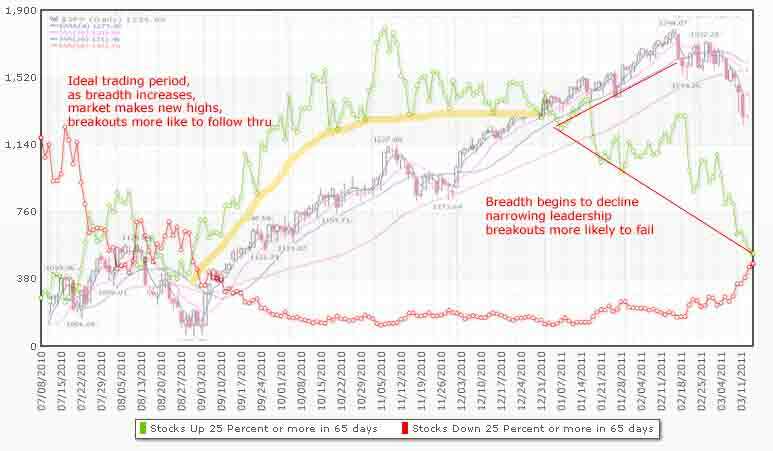 As breadth is increasing, the number of stocks that will likely follow through is higher, as breadth is decreasing breakouts are more likely to fail. Sticking with the very top sectors can keep you in the market longer but eventually something has to give. You can equate it to standing on a strong base made of rock versus standing on thin sheet of ice that can crack any moment. As you can see, the market was flashing warning signals weeks in advance of this decline. It's up to you to figure out how to interpret that data and act on it. How often will you update the MM charts? They are updated every day.